Einar James “Jim” Nelsen, along with Loren Sogaard, Alfred Thompson and one other man, took the train from Springfield to Minneapolis in October 1942, after the corn was picked, for the purpose of enlisting in the U.S. Navy. They chose the Navy because they didn’t want to be drafted into the Army. Alfred and the other man (whose name Jim doesn’t remember) were rejected for service. 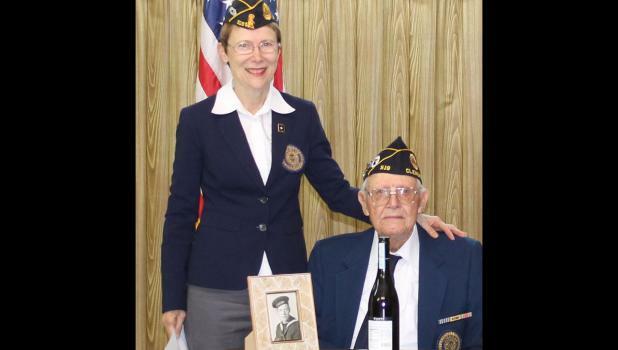 Jim and Loren were enlisted on October 23, 1942, and sent to Great Lakes Training Center. Jim was subsequently trained as a torpedoman’s mate. During Jim’s service, he served on two ships, the USS Burns and the USS St. George. He joined the crew of the USS Burns at the Naval shipyard in Charleston, South Carolina. The Burns was a destroyer. They cruised through the Panama Canal for service in the Pacific Ocean. The Burns was known as the “Battlin’ Burns” by her sister ships because she was always in the middle of the action. At one point, when the Burns was 20 miles from the rest of her squadron, a Japanese convoy consisting of a transport, a tanker, and two smaller ships, were sighted. The Burns took them on singlehandedly at close range, once passing within 100 yards of them. They were close enough to see the Japanese sailors running around trying to put out the fire on their decks. Jim recalls that “he and his fellow sailors felt sorry for them, but they didn’t feel sorry for us!” It was also while he was aboard the Burns that Jim experienced the ceremony that accompanies the crossing of the equator. In February 1944, Jim was transferred to Tacoma, Washington, to be part of the crew of a new seaplane tender, the USS St. George. Highlights of his time aboard the St. George included the ship being hit by a suicide bomber while rescuing a disabled ship.